A few words to tell you that your “tree home” is so, so special and the location is a hiker’s dream. Our guests, ~~ 5 boys between 9 and 14 yrs., were in a dream world. They never stopped moving, swimming and exploring. We went to all the places you suggested and they found trails on their own, explored the Chattooga trail and did some fly-fishing with their dad by the Iron Bridge. Oh my, they were hungry all the time! And the best ~~ Sliding Rocks, it was so, so chilly but they were all relentless and the laughter was such a joy! “Heaven on earth! What a spectacular location and the house is wonderful. We enjoyed the porch at night – wish we had brought the telescope! We also enjoyed the trail out back . . . “ – Ann K.
“ . . . this is one of the nicest vacations we have had. We shall miss the ever changing views of the mountains, the good-tasting water right out of the faucet, being able to see lots of stars, sleeping with the windows open . . . “ Debbie E.
“ I don’t think we have ever stayed anywhere with such amazing views – 360 degrees – it was beautiful . . . our granddaughter especially liked the “Harry Potter” room . . .” – Ann S.
“Your home fits its surroundings perfectly – spectacular! We really enjoyed the views of gold, orange and red. Mother nature did a wonderful job: the hiking to the streams and waterfalls are breathtaking. We enjoyed sitting outside to see so many stars.” – Kim A. “We had a wonderful time vacationing at your beautiful home. The kids loved the hike down to the river. We all enjoyed horseback riding, the waterfalls, tubing, campfires and shopping! It was so relaxing for us to have the kids playing outside without worrying about them. Your house was plenty big enough for all 12 of us . . . “ – Jennifer B. The hikes through your trails gave our kids a great thrill. I think this house is beautiful. Your home is warm and welcoming with spectacular views. Your home afforded us the opportunity to gather in once place yet not be cramped for small group areas to share and play games and find “space”. Our grandchildren loved playing in the little play-houses. The kids loved the “clubhouse”, loft and of course the woods. What an amazing house and view. We enjoyed the fire pit all evening. This is a very beautiful place and ideal for family get-togethers. Your lodge is great and the river is full of trout. The play areas are a blast. Easy 20 minute drive to the wonderful resort towns of Cashiers (to the east) or Highlands (to the west), but still a "deep woods" location at the end of a road with fantastic views of the mountains across the valley. Very private and rustic with only one neighbor in sight. 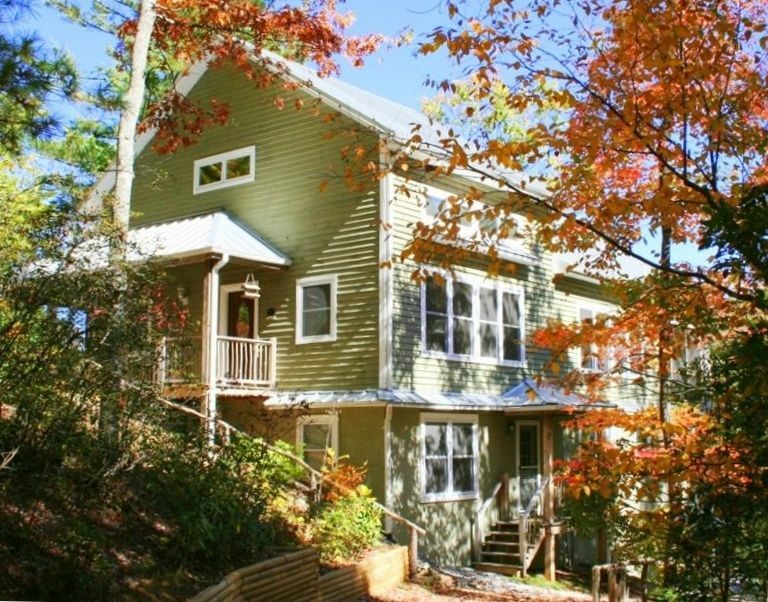 Our backyard borders the Nantahala National Forest, and a 15-minute path leads to the Chattooga River and Chattooga River Trail with beautiful river access, picnic areas, swimming holes and endless hiking. This area is rated 'wild and scenic' by the forest service - a rare honor! Kids love this place as we have built a special 'kids cave' inside - cozy and kid-size to get away from the adults - they have their own secret spot! Outside are play areas, swings, fort and hammock - and of course most important of all - the woods! Trails run through the woods, and the day will fly by while they explore. All the outside features are close enough so parents can enjoy their time on the upstairs screened porch and still keep an eye on the children. Built in 2003, this passive-solar design brings the sun in during winter, so is naturally warm then, but shades the windows with overhangs and tree cover in summer so we stay cool! It also includes air conditioning and ceiling fans, a toasty see-thru gas fireplace on the main floor, and electric heat in each bedroom. The open floor plan designed especially for family reunions. We have four full bathrooms, six bedrooms (one with a king size bed, four with queen size, and one with two twins), plus large loft (with bunk bed & two trundle beds), plus den w/trundle bed . . . this place can hold a LOT of people! Other rooms include family room, dining room, breakfast nook, and screened, covered patio and exterior deck with charcoal grill. Five BRs share adjoining baths. The mail-level BR has the two twins and is designed for limited mobility persons with a bath nearby and low-threshold shower stall. For mealtime, there is a 12-14 person dining room table, plus large circular table for 4 - 6, plus seating for 6 at the kitchen bar-top. State-of-the-art appliances, including large center-island kitchen with gas range, microwave, blender, and two coffee makers (including Keurig). Also a large laundry room with washer and dryer. I built this for my own family and go there often when its not rented. It is stocked with many books, games and DVDs (and usually staples and condiments in the pantry). Also have satellite TV and WiFi, and a treadmill with DVD player for those who like their exercise inside. Edible plants outside include blueberry, blackberry, elderberry, gooseberry, pawpaw, hazelnut, currant, cherry trees, grape vines, etc. Originally from Florida, we grew up we spending time every summer at my parents summer home nearby. Wonderful, lifelong memories were created on each trip, so as I got older I decided to build a place of my own, and big enough for family reunions. I did not originally intend to make this lodge available as a Vacation Rental, but I bumped into a rental owner who convinced me it was a good idea. I tried it, and based on the glowing reports I get from my appreciative renters I am sure I am doing the right thing. This is not your usual Vacation Rental. It is first and foremost my 'mountain house', and is fully stocked with games, DVDs, books, etc. There is almost always unopened food in the pantry and refrigerator that guests are welcome to use at their discretion - no replacement necessary - but I usually find more food than I left! We chose this location because it is so close to the gourmet mountain towns of Cashiers and Highlands with their great shopping, dining, golfing, outdoor activities and people. (We see more of our friends up here in the summer than we do at home!) The elevation is cool, the woods are deep and lush, the air is clean and fresh, and the water is the best you will ever drink! Our backyard borders the national forest - we wouldn't have it any other way! Peace and quiet, and nature's beauty are right outside the door. On site we also have a fire pit for campfires and smores, hammock, swings and kids play area, and lots of adventure for the kids. We also rent to lots of wedding parties from weddings in Cashiers and Highlands . . . we're a quality, fun, inexpensive alternative to lots of individual hotel rooms! Central heat on the main floor and loft. Electric baseboard heat in the bedrooms. We have free WiFi access. Bring you own computer. In the den we have a treadmill. Large, extra quiet dishwasher - you hardly know its on! Stocked with staples like flour, sugar and a huge spice rack. You are welcome to use what you like, and leave behind clean, fresh condiments, etc for the next guest. We supply a very large number of dishes and utensils. Dining area is adjacent to the breakfast room (large round table) and kitchen bar (seats 6), so you can seat 20 people or more in the same area. Many books - a mini library! - of a wide variety of books. We have lots of Board Games. Lots of videos for the kids and family. We have a fantastic fire pit and hammock. We also have a kids fort out back. Many edible plants too. The third of our patios is downstairs out back. Covered by a tin roof and grapevine arbor. There are adirondack chairs and a picnic table. Very cozy, and nature is only a few steps away! The parking lot is gravel, but it is very close to the front porch and door. Not ideal, but we have had guests with wheelchairs who were fine. The main floor has a Bedroom with 2 single beds, and a nearby bath with low-threshold shower stall. Living room, dining room kitchen, deck and porch are also located on this floor, so limited mobility guests need not miss out on any of the action. For exercising there is a treadmill in the den with flat screen DVD/VCR, Den also has a trundle bed and is main-floor level, making access easy for the physically impaired (No steps necessary) Contact me for a detailed list of nearby 'Things to do - Places to go' My guests rave about this list, and it ensures your days are packed with fun adventures. Great place for a gathering! This was a lovely home to share Christmas with my family. 12 family members were very comfortable. We could have easily slept 10 more. It is difficult to find the first time but otherwise fantastic that it is so private. The kids loved to climb the mountain and play on the swings. Everything was well stocked and supplied. I could have used some better fry pans for cooking. This property is amazing. We stayed here during Thanksgiving week and I'm certain it will be an unforgettable vacation for all 16 of us. The home has stunning views. The accommodations were perfect and gave everyone privacy. The kitchen was well-equipped for cooking our Thanksgiving feast and the dining room allowed us to gather in one place. The surrounding area has many things to experience, especially the beautiful waterfalls. Thank you Craig Melby for sharing your home with us. Several family members were very impressed with the home! The only problem I have is with access road! Many thanks to Mr. Melby! Thanks, Martha! We apologize for the road and are getting it refreshed right away. Come back anytime! Great to have so much family together in one house. Well equipped for entertaining. We had a wonderful stay at this large, well equipped house. Craig, the owner, was very accommodating. His many lists of places to eat, waterfalls to see, and things to do were extremely helpful. The house is laid out very well, with lots of sleeping space. The kitchen is VERY well equipped, including spices and condiments, in addition to many pots and pans, and other cooking utensils. . My husband used the grill 3 nights. The view from the kitchen windows and porch is breathtaking. We would definitely stay here again! My family thoroughly enjoyed our stay. The lodge is very nice, plenty of space, large table for meals, and a nicely accomadated kitchen. Highly recommended. A path from our property leads to the 'wild and scenic' certified portion of the Nantahala national forest, and the Chattooga River and Trail. Canoeing, flyfishing and white water rafting are nearby, along with countless trails and waterfall hikes. There is MUCH to see and do, and I provide guests with a long list . . . too much to type here! Holiday weeks are charged at the same rate as Peak Season: $2,950/week plus sales tax. Cleaning is included.